Following the BBC’s Troy series, it is useful to remember how much classical information came through the programme of schools in the past. 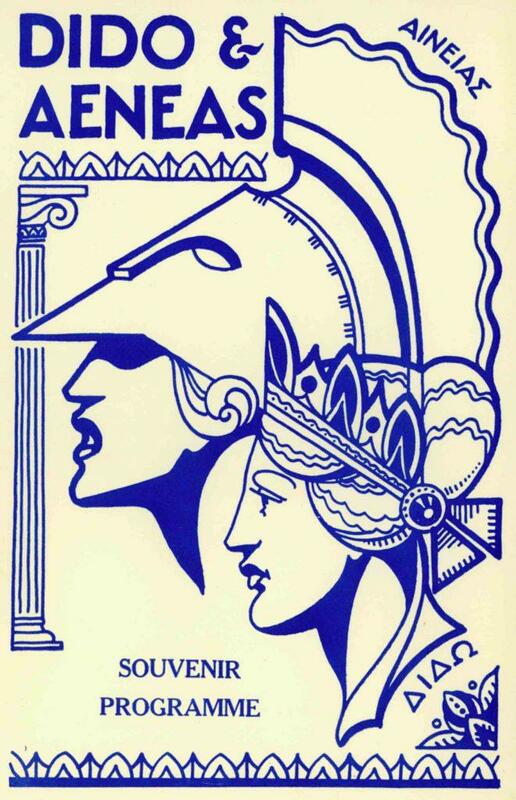 Featured is the brochure for Dido and Aeneas produced by the High School of Stirling and performed in Museum Hall, Bridge of Allan in June 1957. The opera was composed by Henry Purcell in 1688 and its production in Stirling was a major effort, with the help of the Snowdon Orchestra, musicians from the Royal Scottish Academy of Music and lighting from the Stirling Amateur Dramatic Society. This was an accomplishment, considering that when George McVicar was appointed as Stirlingshire’s first Supervisor of Music in Schools in January 1956, he was told that he was “going to the worst musical desert in Scotland” where one violin instructor served every school between Grangemouth, Kilsyth, Killearn, Balfron and Balmaha. Musical fortune varies from one generation to the next, and Muir Mathieson, who left the High School of Stirling in the 1920s was the still the pre-eminent composer to the British film industry in the 1950s. The programme was printed by Jamieson & Munro of the Observer Press and designed in the art department of the High School, headed by James Atterson. It is one of a collection gifted to the Stirling Smith by Mary Cooper in 2004.